‪ I’ve been reading the work of Robert Bauval since the publication of The Orion Mystery—the groundbreaking book he wrote with Adrian Gilbert in 1994 on the alignment of the pyramids of the Giza Plateau with the three stars in the belt of the Orion Constellation. I have looked forward to each of his publications with great anticipation, and have never been disappointed. This spring he released what I consider to be his most important research to-date. Black Genesis: The Prehistoric Origins of Ancient Egypt, co-authored with astrophysicist Thomas G. Brophy, summarizes studies from the last four decades that point to a mysterious neolithic African group that lived in southern Egypt as the forebears of Ancient Egyptian civilization. It has has been widely known in archeological circles for several decades that these “star people,” as Bauval and Brophy have dubbed them, created an early complex society that developed the key social, cultural, and religious symbols, concepts, and rituals upon which Ancient Egyptian civilization was built. But in recent years the picture has become much more complete due to extensive archeological studies in the remote areas of the desert where they lived and roamed thousands of years ago. Recent discoveries of amazingly well preserved prehistoric rock art in the region have provided important information on the habitat and culture of the “star people.” And climatological studies have shown that changes in rainfall patterns and the desertification of the southern Sahara region were environmental factors that led to their migration into the Nile Valley. 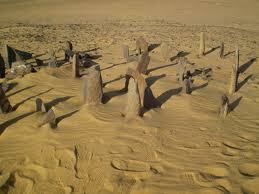 Much of this research has been centered on investigating the megalithic circles at a site depicted in the photo below known as Nabta Playa. This ceremonial center and the ancient calendar system it contains has been dated to circa 6,200 BCE. It pre-dates the founding of the nation-state of Kemet (Ancient Egypt) by more than 3,000 years, and Stonehenge by more than 4,500 years. Although still little know by the public-at-large, Nabta Playa is one of the most significant findings in archeological history. The evidence it furnishes provides yet further confirmation of the “black” African origin of Ancient Egyptian civilization, a subject which never should have been debatable. The following link is for a 2008 interview (audio with slides) with Robert Bauval conducted by Richard Fusniak. In it Bauval provides an excellent overview of the book and his research: Black Genesis, the book -interview by Fuzzy with Robert Bauval‬‏ – YouTube. Click here to go to The Official Website of Robert Bauval for additional information about the author and his work.. This entry was posted in Africa, History and tagged African Prehistory, Ancient Egypt, Black Genesis, Megaliths, Nabta Playa, Robert Bauval, Stone Circles, Thomas G. Brophy by Ourstorian. Bookmark the permalink.